Liegen, stelen en bedriegen - onze emoties bespelen en de illusie in stand houden, zeg maar - is nu éénmaal waar acteurs crimineel goed in zijn en de sterrencast uit deze lichtvoetige misdaadkomedie trekt alle registers open! U herkent ook nog Parker Posey (Superman Returns), Sofia Vergara (Modern Family) en Stephen Fry (Gosford Park, V for Vendetta). LATimes.com: A stylish caper with enjoyably wry, martini-soaked dialogue and a terrific comedic turn by Uma Thurman as a glamorous British scam artist. RogerEbert.com: Excellent cast. It's great to see Thurman in a movie star part again. Flickeringmyth.com: While the characters are all over-the-top caper archetypes, the cast seems to be having the time of their lives. Tim Roth is trying his hardest to beat Gary Oldman's nicotine poisoning in Darkest Hour by drinking ALL the martinis and straight vodkas in the world, to the point where it seems of if he doesn't have a drink in his hand. He also shatters, drops, and otherwise breaks so many glasses I would not be surprised to hear their alcohol and glassware budget was comparable to the cocaine budget in Blues Brothers. Stephen Fry is a delight as usual, and he seems to be amused by all the other characters to really give a damn about the story. Reeltalkreviews.com: Thurman (Kill Bill) oozes so much glamour playing her morality-challenged character that she holds our interest in all of her scenes. Plus, Maggie Q (Divergent) makes a very relentless villain. Thatmomentin.com: Good work from Thurman and Roth, who both do well as curiously likable terrible people. Ondanks torenhoge schulden lijken Pete Cozy (Eric Mabius - Resident Evil, The Crow: Salvation) en zijn gezinnetje een gelukkig bestaan te leiden. Ze wonen in een gezellig huisje in de buitenwijken en Pete heeft een baan bij de aankoopdivisie van een middelgrote supermarktketen. Alles verandert echter wanneer Pete een nieuwe chef krijgt: de mooie, hyperkinetische spraakwaterval Susan Felders (Parker Posey - Party Girl, The House of yes). Price Check is een intelligente, goudeerlijke comedy die in vraag stelt wie we écht denken te zijn en waartoe we bereid zijn voor het leven dat we denken te verdienen. Variety: Parker Posey grabs the role of marginally psychotic supermarket schemer Susan Felders and squeezes it like an overripe organic cantaloupe. A terrific showcase for indie princess Posey, leading a topnotch cast. Its graceful swing from giddy to sobering could appeal to a wide-ranging audience. TheHollywoodReporter.com: A prime example of the type of well-produced, smartly cast independent features that Sundance has been helping launch into the theatrical marketplace over the past few years. Latimes.com: Writer-director Michael Walker keeps a firm grip on his smart material, offering up big laughs, lots of recognizable behavior and, in the end, a wistful glimpse at life's inevitable priorities. Nypost.com: A hilarious Parker Posey provides her customary blast of brittle energy in 'Price Check,' an engaging corporate comedy. 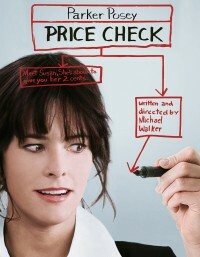 NYTimes.com: The indie film goddess Parker Posey cuts a ferociously funny swath through Michael Walker's 'Price Check'. With its portrait of a passive-aggressive staff under the thumb of a slightly loony boss, 'Price Check' is similar to 'The Office,' though it has a sharper bite and shows a keener awareness of recession-era anxieties. Slantmagazine.com: Urgent, persuasive, and funny. The film's talented troupe members make a convincing, bizarro staff, exploiting the airless setting with continuous laugh-out-loud results. And front and center, of course, is one faithfully avid comedienne, whose mercurial performance is a picture of multi-tasking. JoBlo.com: The actors are strong and have palpable chemistry. Posey can do faux-happy bordering on dementia like no one else, and as mentioned before, this is the role she was born to play. FilmDilettante.com: For it's outrageously funny situations, Parker Posey's dead-on performance, a full comic cast in the tradition of The Office, and a provocative subject matter, I rate Price Check three out of four cappuccinos. Blu-ray.com: Guided by a fireball performance from Parker Posey, 'Price Check' is uncomfortable to watch in all the good ways, finding authenticity from an ugly situation, while working through 'Office Space' particulars with a sly sense of humor and an appreciation for the humiliation and anxiety of an exhaustive 9-5 life. EntertainmentWeekly.com: Posey, her attention divided up into slivers, is funny as hell, but she's also terrifying in her evocation of a kind of moment-to-moment PowerPoint existence. TVGuide.com: Price Check makes its unstable employer a woman, and with Parker Posey in the lead, the character is also quite funny and multidimensional for all of her abundant flaws.